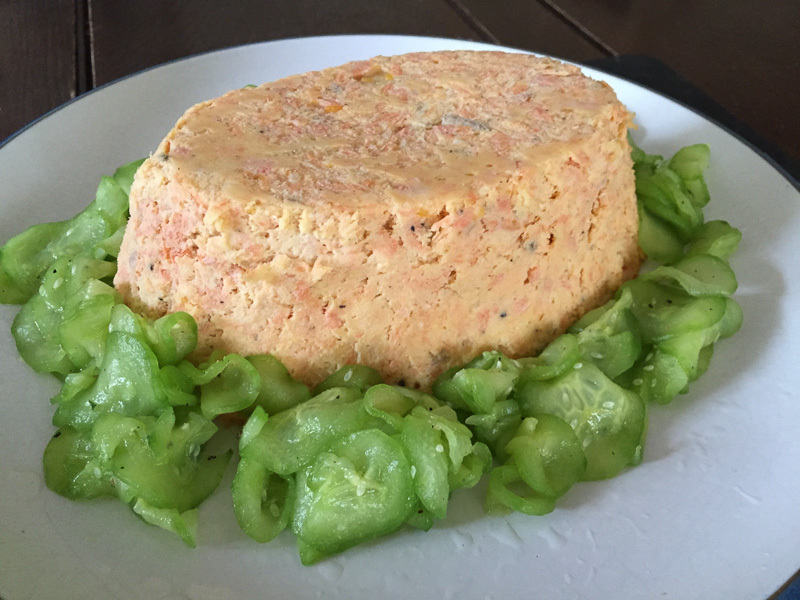 I was looking for something relatively easy to make over the Easter break, and the Salmon Mousse with Cucumber Salad recipe looked pretty straightforward. To start, I took a fillet of salmon, wrapped it in foil and cooked it in the oven. Once it had cooled, I broke it up into small flakes with a fork. 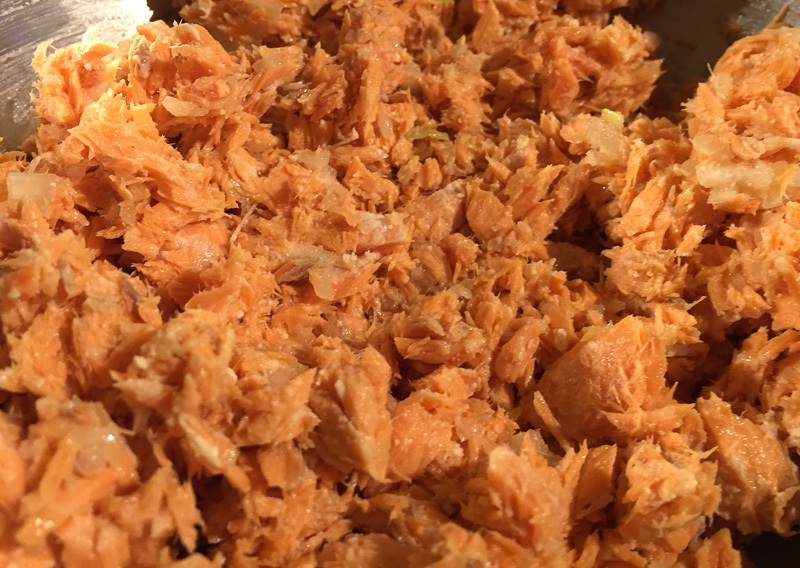 Then, I finely grated half an onion and mixed it into the flaked salmon. 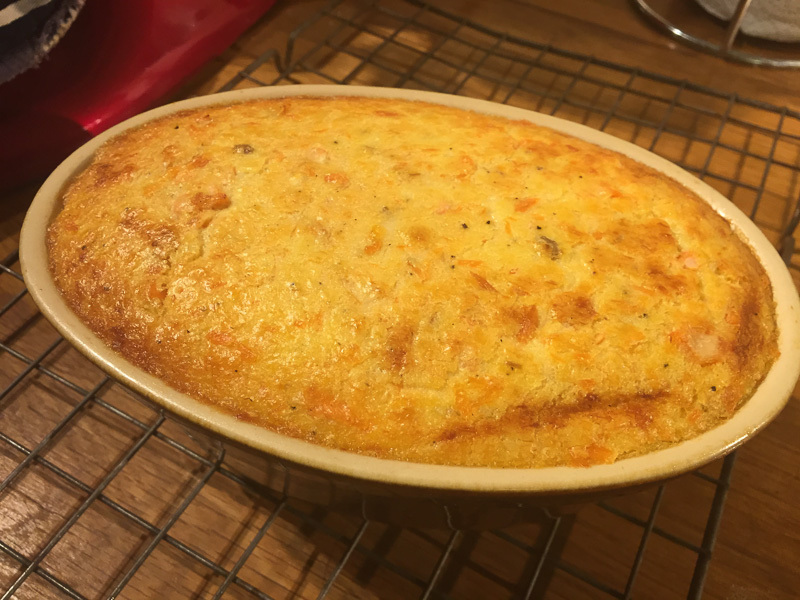 Now I need a béchamel sauce – that’s a “see page 50” back reference. So, back to page 50 I go. Page 50 is the creamed spinach recipe – I haven’t made that one yet, but it starts with béchamel. 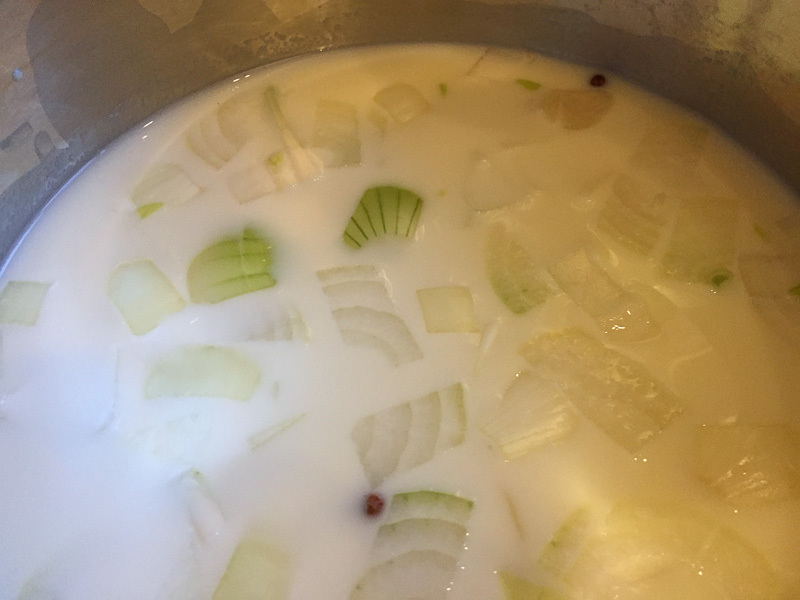 First, milk, onion, cloves and a little salt are brought to a boil in a pan and simmered for a couple of minutes, then left to cool and to allow the flavours to mingle. After about thirty minutes, I strained the milk into a jug. 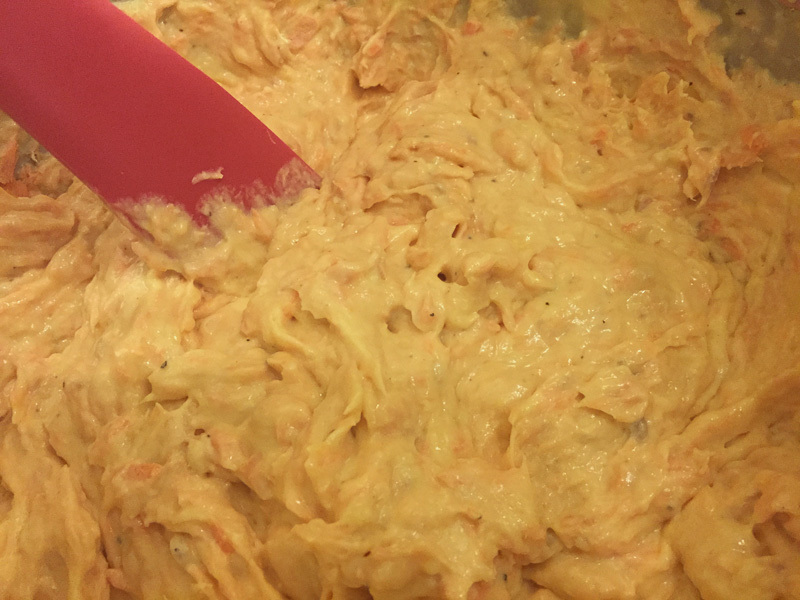 Next, a roux. 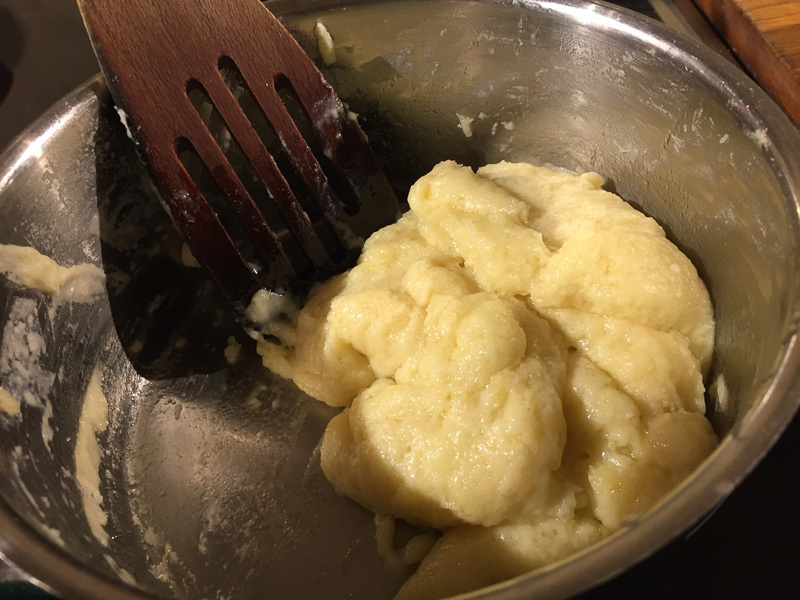 I melt butter in a pan, added flour, and cook for a couple of minutes. Then, add the milk and stir vigorously until well mixed. 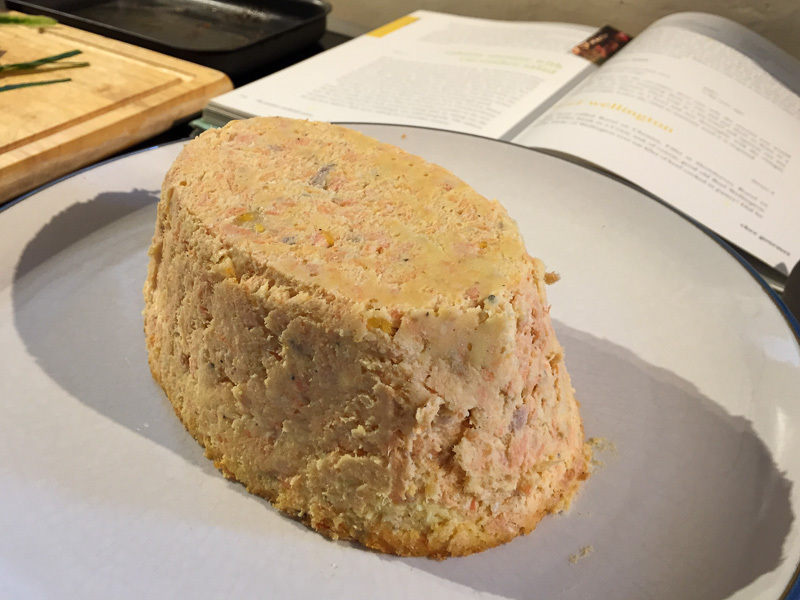 Here, the recipe says, “You may think at this point that it is very thick, but this is intentional…”. They aren’t kidding – this thing is like a brick. Anyway, I do as I am told, and cook my béchamel brick for fifteen minutes over a very low heat, prodding at it from time to time with my wooden spoon. Finally, I mix in cream, nutmeg and ground pepper and mix it in well. It’s still a brick, albeit a slightly softer brick. I stir in some more cream, just in case. Next, beat four egg yolks, stir in cream and then stir into the béchamel. 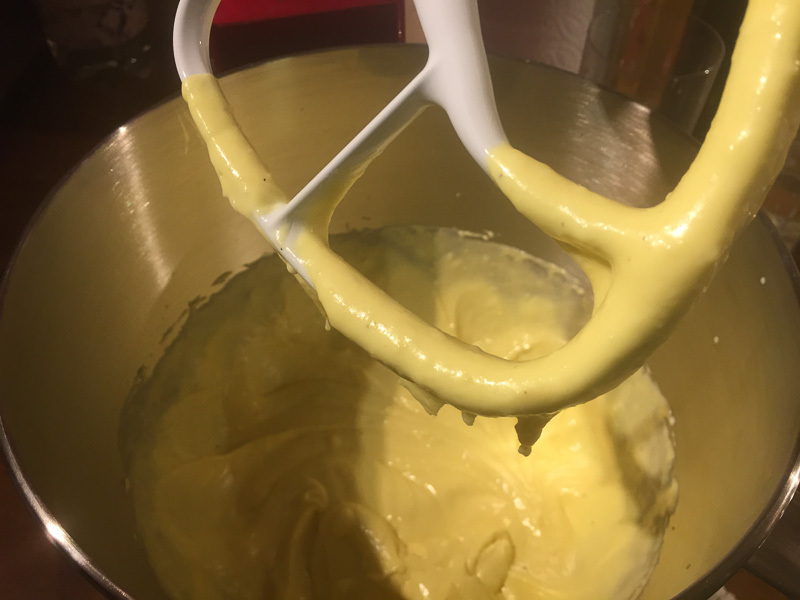 Well, I say ’stir’ – in the end, I had to use my stand mixer to break up the béchamel brick and whisk it all together into a creamy sauce. Finally, add some seasoning and combine with the salmon. 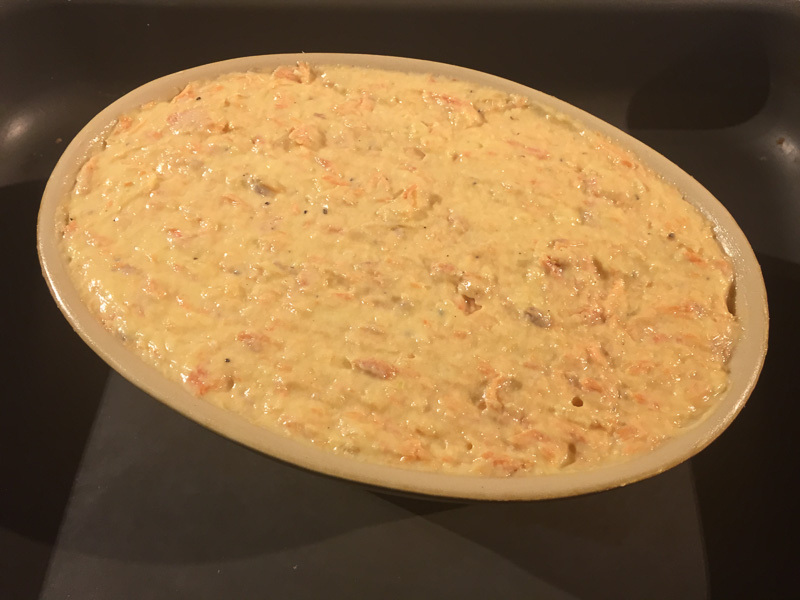 I buttered a dish and filled it with the salmon mixture. I placed the dish into a deep roasting tin and added water until it came halfway up the dish, then baked in the oven for forty minutes. About five minutes into the baking process, I realised that I had forgotten to cover the dish with foil. Out it came. The top was starting to firm up, but I don’t think any harm was done. I cover the dish with foil and put it back in the oven. Once done, remove the foil and put the mousse to one side to cool. This was to be the following day’s lunch, so once cool, it gets covered with cling film and put it in the fridge overnight. The next day, I prepare the cucumber salad. Peel the cucumber and slice thinly. Season with a little salt and put into a colander to drain. After half an hour, I wrap the cucumber in a tea towel and squeeze to “remove excess moisture”. I’m not sure how you determine whether the moisture is “excess” or not, so I just kept squeezing until water stopped dripping out – there seemed to rather a lot. After unfolding the tea towel, the cucumber was looking a little mangled. 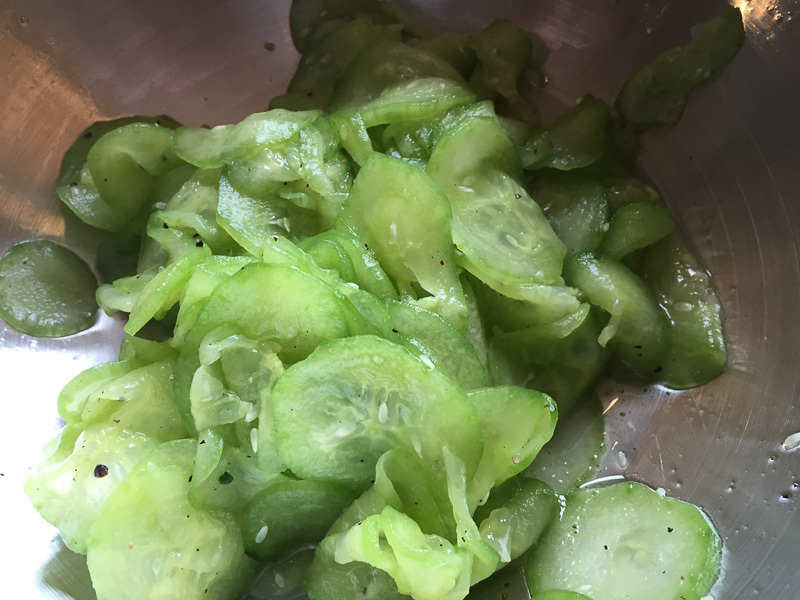 So, into a bowl with the cucumber, then add white wine vinegar, caster sugar and pepper, and mix thoroughly. Now the tricky bit. I have to get the salmon out of its bowl and onto a plate. I loosen the top edge with a knife and then invert the bowl onto a plate. It doesn’t budge. I bang it heavily on the counter – it still doesn’t want to move. In the end, I have to run the knife around all the way around the inside of the bowl, all the way to the bottom, before I can shake the mousse free. Thank heavens I wasn’t using an elaborate shaped mould here. The mousse itself looked pretty good, especially once I’d added the cucumber salad around the edge. I served it with some lightly toasted slices of bread. The mousse itself was really nice – it had a soft, delicate flavour and a beautifully light texture. The crunch of the vinegared cucumber provided a perfect contrast. It was all delicious. I had never had salmon mousse before. Something I’d not thought about so when Dave produced a gorgeous looking piece of sockeye salmon, deep reddish pink, I hoped he was going to roast it for dinner. Turns out he did roast it, but then he turned it into the mousse. It would have looked beautiful set into a ring mould but we don’t have one so he used a bowl. The end result, sat within it’s ring of finely sliced and peeled cucumber reminded me very much of a pink blancmange set in a rabbit mould sitting in a ring of grass green jelly! A regular Sunday tea treat when I was a child. Happily, it didn’t taste like strawberry blancmange! The lightest of textures, it has small pieces of fish in it, so it’s not a smooth texture, but it was still airy and light. A delicate flavour with interesting subtle additional flavours. Spread on finely sliced toast it was delicious. We had it for lunch. Very fancy. I felt a butler should have served us on china plates.